1. What is Saucony Everun? That said, Saucony’s spin on Everun is nowhere as impressive as adidas’s interpretation. Should be pretty obvious, considering how watered down this execution is. 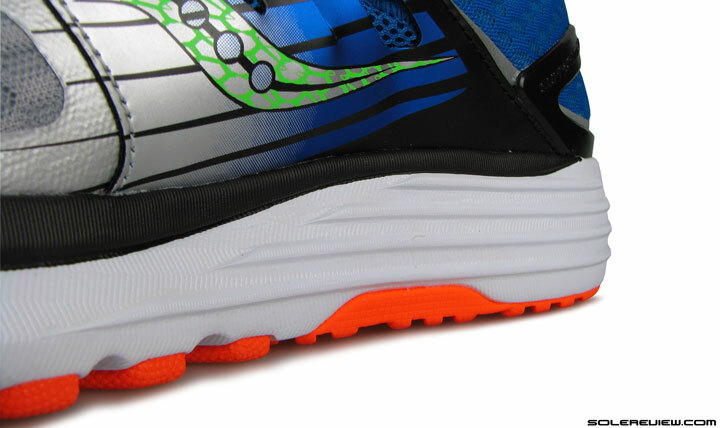 The Everun only contributes to a small percentage of the cushioning delivery mechanism. 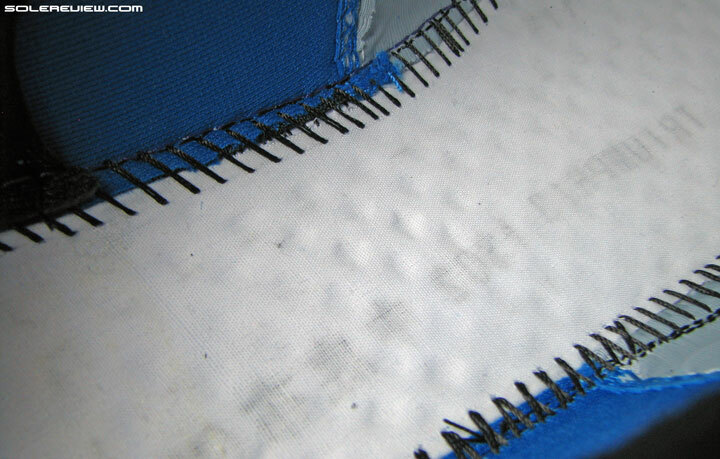 The bulk of padding duties is still performed by the humble EVA foam. 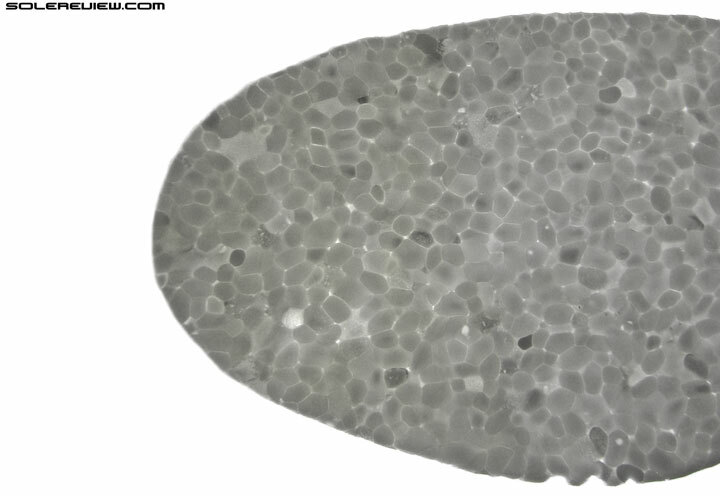 Majority of the midsole cushioning on the Triumph ISO 2 is still delivered by the regular EVA foam. The Everun bits are mere garnish, so while the new tech undoubtedly impacts the ride character, the difference isn’t as much as one would imagine. The Triumph ISO 2 is a very good shoe, as was the 2014 Triumph. Yet the ride quality ends up being very similar, which leads you to wonder whether an upgrade was worth it. Saucony marketing goes hyperbolic on the Everun, using power phrases like ‘rock your running world’, and ‘dramatically more lively and responsive’. However, the final product experience fails to keep pace with its marketing (as was the case on Powergrid+). Hence with the ISO 2, one just needs to manage expectations, and the world will be a happier place. We’d say that the ISO 2 is a very competent shoe, just not very engaging in character. It is clinical all-around goodness with the personality of slightly peppy minivan. That aside, there are plenty of updates on the ISO 2 worth writing about. 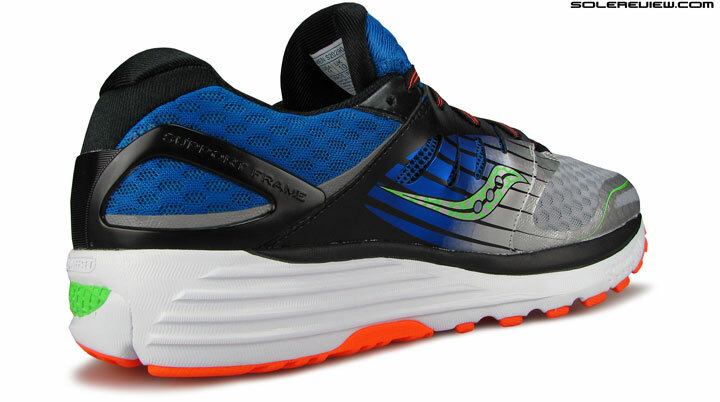 A lot of it is condensed in the new midsole architecture, while a few are scattered across the span of the ISOFIT upper. We’ve been ranting about the new Everun insert for about a page now, so without much ado, let’s lay the minutiae out in the open. Fundamentally, the Triumph ISO 1 and 2 aren’t all that different. The layer which separates your foot from the ground is still comprised of compression molded EVA with a 8 mm drop, an outsole made of softer blown and firmer hard rubber, plus the removable insole. There are new faces in the crowd, like the Everun midsole lining and the crash pad, which leads to an altered cushioning action. If we had to round up the differences in ride behavior between the two Triumph ISO versions, it’d be two things. The first is that the ISO 2 is more responsive than the 2014 ISO. The other part is a bit counter intuitive, which is that the new ISO feels slightly firmer than the last generation Triumph. Strange, is it not, given the Everun infusion? As it turns out, the outsole and midsole architecture plays an important role in affecting the soft vs. firm feel. 1) Forefoot has a ‘filled-up’ design instead of smaller pods 2) Shallower pods, and the outsole is bonded to the firmer EVA now, not the softer crash pad 3) The transition grooves goes shallow, and the split heel edge narrows the gap. Though the Triumph ISO 2 outsole maintains the soft and hard rubber combination, the layout gets a significant make-over. The forefoot is redesigned; replacing the smaller pod-like lugs of the 2014 Triumph are horizontal strips which look like forward-facing Chevrons. Last year’s Triumph ISO had these small lugs sit on foam pods, which compressed under weight. None of that is available this time around, with the herringbone strips forming an unbroken piece of rubber placed sideways. Blown rubber lines the forefoot under-side. With the pod like structures gone, the midsole loses a bit of its former soft feel. The integrated rubber strips under the forefoot tones down the pod effect, and in its place delivers a firmer ride. 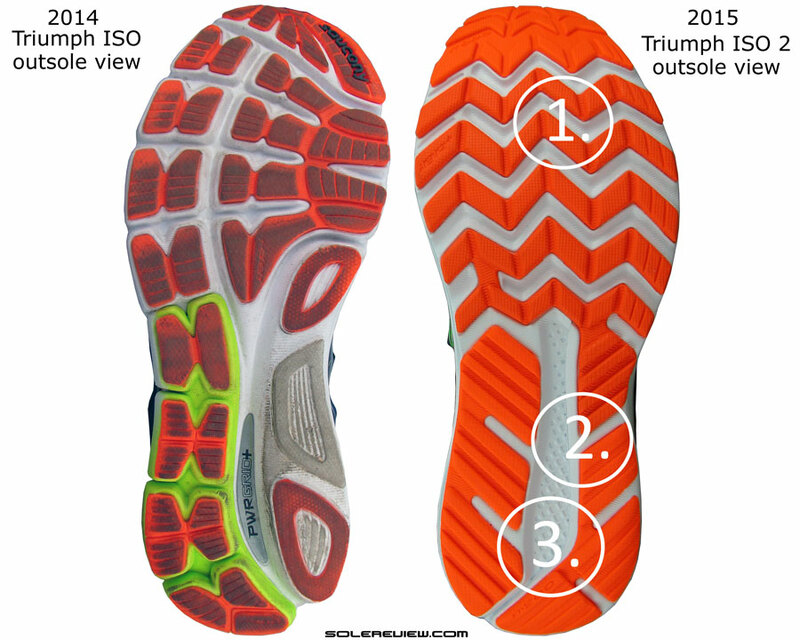 That said, what the Triumph ISO 2 loses in cushioning softness, it gains in better transition and ground feel. 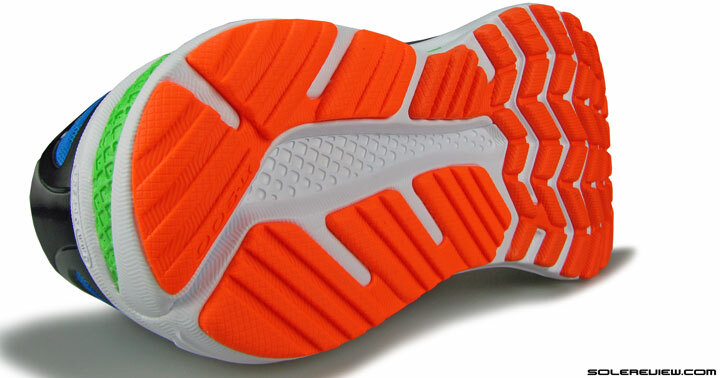 With the corrugated rubber segments uniformly covering the underside, the forefoot feel is more consistent. The outsole in the front is still blown rubber, so the Triumph ISO is spared of jarring landings. 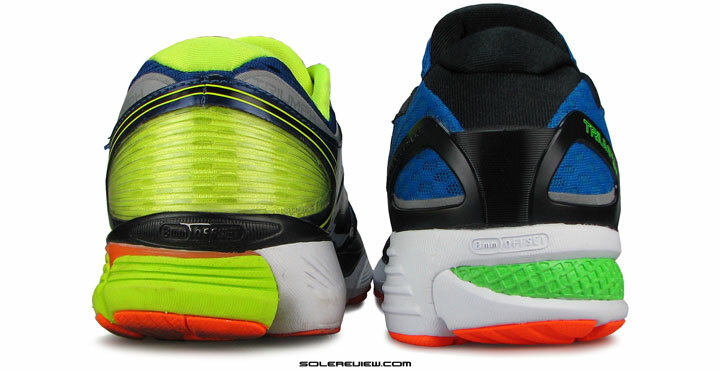 Spot the differences: The lateral Everun heel wedge is smaller than the SRC version it replaces; the outsole is mounted on the firmer EVA and not Everun. Similar winds of change blow over the heel and midfoot. The medial midfoot which was previously exposed EVA foam is now topped off with rubber, and the lateral (outer) side loses the split pod outsole design with its deep grooving. It is also important to remember that the 2014 Triumph’s split outsole was mounted directly on the softer SRC crash pad. That isn’t so on the Triumph ISO 2. The groove deprived rubber outsole is mounted on the firmer EVA and not the Everun crash pad. The heel to midfoot transition groove loses depth, and the split heel also goes shallower. Result? Less splaying, which means increased firmness. Lastly, the heel edge has a major role to play here. On last year’s Triumph ISO, the medial and lateral heel center was separated by a deep groove – the one which also separated the regular EVA foam from the SRC crash pad. This has been filled up on the ISO 2, along with an updated transition groove which is now much shallower. This reduces the ‘breakaway’ effect of the heel edge, and reduced splaying of the exposed foam area between either sides of the outsole. Add to this the removal of outsole pods and the firmer lateral side, and you end up with a firmer ride than the 2014 Triumph. So is the new Triumph ISO 2 plush? We’re afraid not quite, but it is definitely more responsive than the previous version. 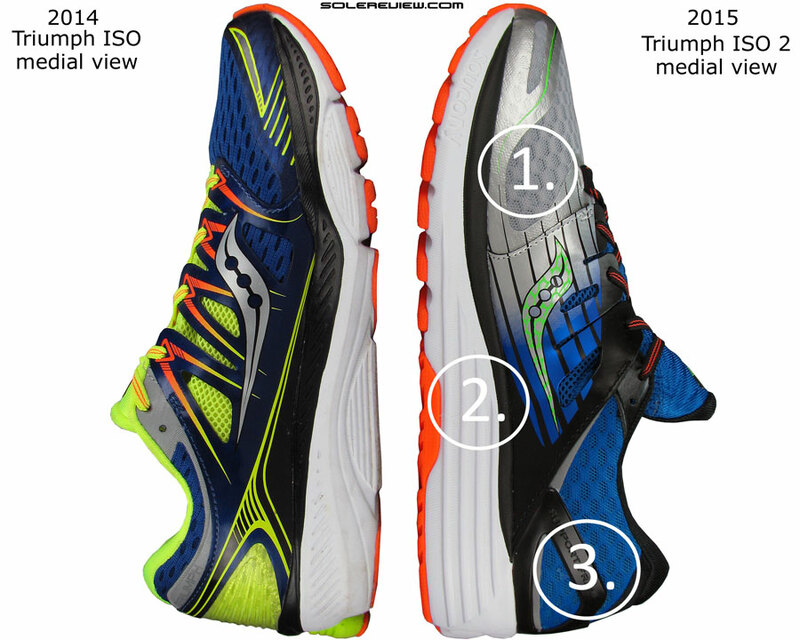 If we had to guess, the upcoming Saucony Ride 9 should ride softer than the Triumph ISO 2. This looks like… adidas Boost foam in cross section. Oh wait, that’s exactly what it is! We had fun passing light through the adidas Boost, so here we go again. Whee! 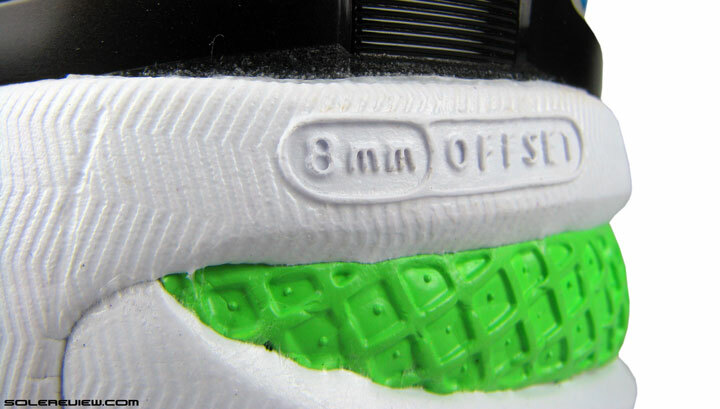 Decoding the responsive part of the midsole is easy. Last year’s Powergrid+ was nothing more than a block of EVA foam with holes punched in them. The Triumph ISO 2 still manages to silently sneak in the Powergrid midsole, but with a difference. The new Everun topping over the Powergrid+ midsole adds a responsive base layer, and at higher speeds the Everun heel crash pad comes into play. This is where the Triumph ISO somewhat mimics adidas Boost; higher pace is rewarded with higher levels of responsiveness. We’ll repeat here – you have to manage your expectations; the Everun is a far cry from a full Boost foam midsole. Think of Everun foam as a adidas Boost teaser, and nothing more. Owing to its midsole design, the Saucony Triumph ISO 2 is a supportive neutral. What hasn’t changed on the Triumph is its supportive ride quality. The original ISO had a firm midsole with a flared forefoot and heel base, and the new Triumph ISO 2 retains that character. The forefoot midsole edges flare visibility out, though the lateral heel slims slightly along with the removal of the plastic stabilizer. 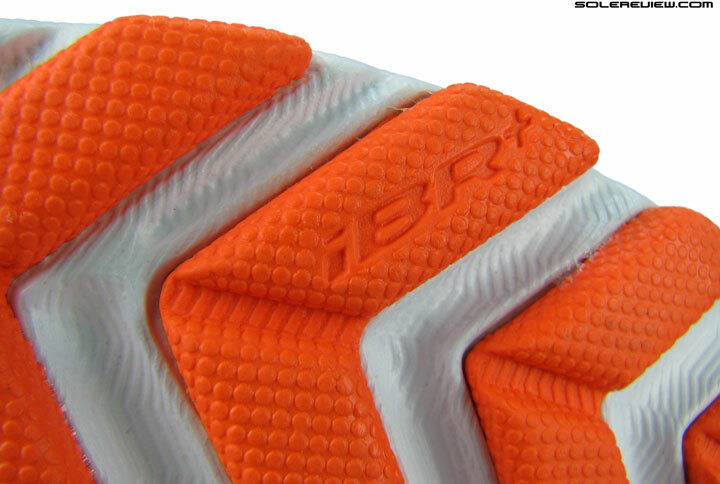 So compared to the 2014 ISO, there is a small amount of cushioning bias which favors the lateral side. 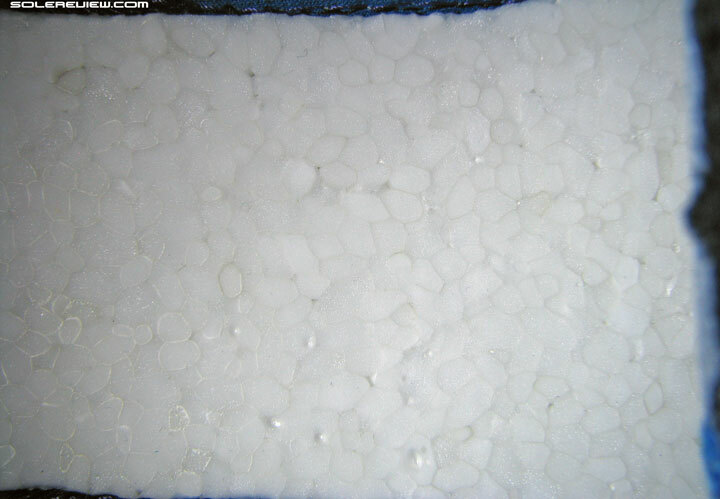 Apart from that, common design elements such as the solid medial midsole and firmer foam density produce a planted ride. The cushioning quality is firm, yet responsive with a strong support overtone. All in all, a well rounded product, never mind the underwhelming Everun experience. So if we had to recommend three $140-150 neutral shoes with decent cushioning levels mixed with a supportive feel, the new Triumph ISO would be one, along with Brooks Glycerin 13 and the Vomero 10. The ride quality is dependable, and there is plenty of midsole depth available to pad your landings. The underfoot feel is consistent, making transitions feel uniform and fuss free. Contrary to what one may think, the Everun heel does not create a sink-spot. I´m just at page 1 of the review but want to say: “Happy new year :)” to you! I wish you all the best for 2016 and may you be able to continue your great work! Thank you so much! Have a wonderful new year! A lot of people say the ISO 1 was better. If this is firmer then I would tend to agree since it’s basically the same shoe with different tech. Saucony, stick to your guns already. Bring the old school raquet grid back please. People who like a softer ride will find the ISO 1 better for sure. Having ran a lot in the first Triumph ISO I was looking forward to the release of the ISO 2. As soon as my local running store had them I purchased a new pair only to be disappointed by the firmer ride. While the upper on the ISO 2 is an improvement, the ride for me was a let down. Some are going to like the more responsive ride, especially those who’ve never ran in the original. I think many who were so pleased with the original (myself included) are going to be put off by the change in the ride. I can definitely tell a difference in the ride. To me it’s not near as forgiving. And for some reason my feet go numb while running in these. I’ll never understand running shoe companies. Saucony already had shoes you could buy for responsiveness, why not just let the Triumph be their soft, highly cushioned shoe for those of us who like that feel? Thank you for the feedback, Mark. 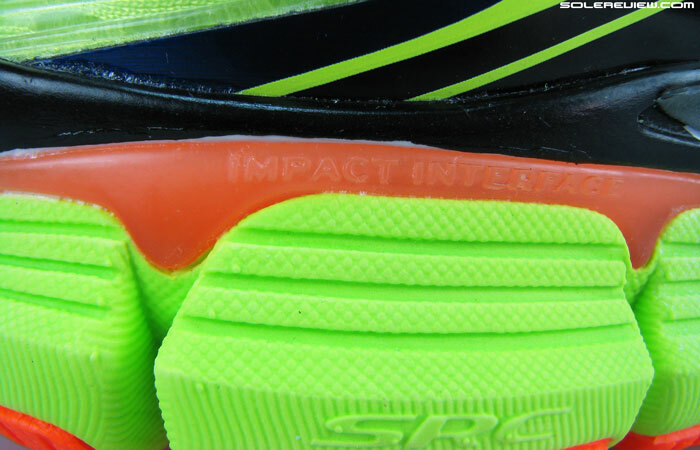 Runners will be divided on the ISO 2 for sure; softness vs. responsiveness. And agree, the Ride is more softer than the Triumph, an aspect we called out in our Triumph review last year. Why exactly would you get your hands on boost foam and water it down like this? The stuff is amazing when used properly. Beats us. Budget issues? Saucony is part of a smaller parent company. I enjoyed the Triumph ISO 1 for close to 300 miles, and purchased the ISO 2 as soon as it came out. I enjoy roomy toe boxes, being an almost but not quite wide footed individual. With the ISO 2, it always felt “less roomy” in the toe box than the ISO 1, but figured it was just the new vs. worn down feeling. Got about 10 training runs in the 2’s and used them for a half ironman. First black toenail in 2 years. I don’t want to blame the toenail on the shoe, but it seems the common opinion is that black toe nail equates directly to lack of space up front (?). I have moved up a half size and this seems to provide more adequate room, but now the upper bunches on me when laces are tied :(. As for the way they feel to me, definitely firmer. I don’t relate firm to bad; however, for the first couple of miles my feet feel “tired”, after a couple of miles I loose that feeling and I’m apparently good for as many miles as I want to put in. I’m currently battling some tendinitis, apparently from to quick of an increase in miles, but have wondered about finding a bit more stability in otherwise neutral shoes. I have had the chance to try on the Transcend 3, and was pleasantly surprised with what seems like quite a roomy toe box. I think I will give those a try. Any other suggestions with regard to more stability, toe box roominess, and cushioned long mileage shoes are very welcomed. The doctor I’m seeing for the tendinitis has the opinion that I’m on the correct (neutral) type of shoe; the finding a bit more stability is of my own creation. Appreciate your detailed insight, Paul. We find it interesting that your comment mentions the ISO 2 to have a smaller toe-box, we thought the reverse to be true! Just shows how feedback varies depending on the individual. We haven’t tried the Brooks Transcend 3, but your comment about its roomy toe-box has piqued our interest. We found the Transcend 1 and 2 to have a tight upper. As regards to your requirement for stable shoes with a roomy toe-box, we would recommend the Mizuno Wave Inspire 11 or 12, Mizuno Wave Rider 19 (neutral but stable), the Hoka One One Constant and finally the Nike Air Zoom Odyssey. curious… the everun insole plus some thin insole (the first one that comes to mind is the adiZero insoles)… can that combo replace a traditional insole of a shoe that lacks some ooomphh in the cushioning department? As a first layer of cushioning under the foot, the Triumph ISO 2 scores well over traditional insoles. The comments/Q&A thread will be closed till January 17, 2016. Any inconvenience is regretted. Premium access members can continue to use their dedicated comment section, which will be open. I recently began running a year ago (28 yrs old). I’ve ran one marathon, and six half marathons. In training for six back to back half marathons, I developed a stress fracture of my inferior pubic ramus. My last half marathon I finished at 1:29 (PR). I have about six-eight weeks of recovery at the moment, and have been trying to do research on whether or not the stress fracture may have been in any way related to the shoes I was training in. Leading up to the stress fracture I jumped from a four day a week running plan to a six day a week plan. Five days consisted of running in the Adidas energy boost. One day a week would be a speed run in the Adidas adios boost 2 or 3 and I was racing in the Adios Boost 2 & 3. Mentally, the stress fracture is challenging. It is hard to know exactly what aided in the cause of the fracture. Could the shoes have been an issue? Upon recovery I was interested in swapping possibly away from Adidas and into something else, but not sure if this would help prevent the issue moving into the future. I think the rapid increase in running and pace caused the fracture, and back to back races…. but is there any recommendation you have as far as the shoes? Are minimalist shoes better at avoiding stress fractures? The research is mixed. Would it be safe or recommended to move to a different shoe? Any suggestions? Thanks. It is just our opinion, but we think the likely cause to be the accelerated rate of training/mileage. The research is mixed because there is no conclusive evidence that a softer (or for that matter a harder) shoe decreases or increases impact forces in isolation. If you want to feel reassured with regards to your footwear choice, then perhaps a Hoka One One (Clifton, Bondi 4) could be an option. It is unlikely that they will reduce the impact forces, but they might end up feeling more comfortable over greater distance. Thanks for the reply. I believe my main concern was how legit the research was regarding min vs. Max in relation to impact forces on bone vs. muscle/tendon. From what I’ve been able to find it’s pretty much as you’ve said. When I’m able to get back into the training I may try the Cliftons out. Attempting to break into the 5 minute pace mark for a full marathon, but recurrence of stress factor of course a worry and making sure all bases are covered. I also feel the fx was a result of rapid increase in training and pace and not the shoes. Thanks for the awesome reliable reviews and the reply. All research has a rationale, but there are just too many variables involved to have a consistent set of control conditions. Hence the mixed findings. Recover soon, and would to hear what eventually worked for you comfort-wise! The Vanquish 2? No miles in them, and unfortunately no plans to review them. My question is, do you consider price while reviewing shoes? Like, $120 Ride 7 is rated a lot higher than $160 Triumph ISO 2, in your opinion, is Ride 7 better shoe than ISO 2 or your rating is relative based on their price? In other words, if ISO 2 was $120, would you still rate it lower than Ride 7? Correct, there is some price weightage, but not significant. Primary considerations are fit, stability and transition quality. The Ride 7 is a better shoe than the ISO. It will be interesting if you review cheaper shoes, like $60 Saucony Cohesion 8, 9. Saw some good reviews for it in other sites. Thanks for the suggestion. But it is unlikely we’ll be reviewing them – no budget.